FlokiBot is a recent banking trojan targeting Europe and Brasil, sold as a malware kit for $1000 on some hacking forums. It is being spread via spam and exploit kits. Even though it is based on ZeuS, FlokiBot shows a lot of interesting improvements, new features like RAM scraping, a custom dropper, and seems to have borrowed some lines of code from the Carberp leak. FlokiBot and its dropper have many both standard and uncommon obfuscation techniques, we will focus on demystifying them and showing how to deobfuscate them statically using IDA and IDAPython scripts. Since you find most of these techniques in a lot of recent malwares, I think it's a good exercise. I decided to take a look at FlokiBot after reading about its dropper in this nice article by @hasherezade : https://blog.malwarebytes.com/threat-analysis/2016/11/floki-bot-and-the-stealthy-dropper/. While most articles on FlokiBot focus on its dropper, I will also try to get into a bit more details and talk about the FlokiBot payload ; we will see that it has some interesting features and is not your usual ZeuS rip-off, even though most of the code comes from the ZeuS and the Carberp leaks. Still better than reversing ransomware anyway. The dropper loads its modules by hashing library names and comparing them with hardcoded hashes. The hashing process consists in a basic CRC32 that is then XORed with a two bytes key, different for each sample. Two methods were implemented to retrieve dll names : using the Process Environment Block to go through the InMemoryOrderModuleList struct and reading the BaseDllName field in order to get the names of the dll already loaded by the process, and by listing libraries in the Windows system folder. Then, FlokiBot does the exact same routine to locate and load which API it needs in those modules. First, it retrieves the address of LdrGetProcedureAddress in ntdll and uses it to get a handle to other API when the CRC of the names match. By doing so, only addresses of functions are visible to a debugger, making the analysis of the code pretty tough since we are not able to see which API are being called. A way to deobfuscate this is shown below, in the next part. 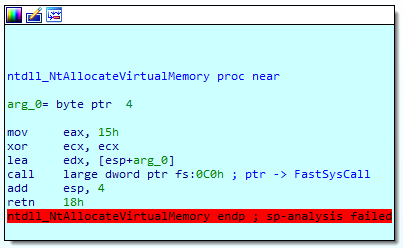 As we can see, the syscall value is put in eax (0x15 for NtAllocateVirtualMemory on my Windows 7 64-bit) and arguments are passed through edx. A full list of those syscall numbers for x86 and 64-bit Windows can be found on this page : http://j00ru.vexillium.org/ntapi/. While going through all API in ntdll, FlokiBot will check if the first opcode of the function is 0xB8 = MOV EAX,. When it is the case and the CRC of the API name matches, it will extract the 4 bytes following the MOV EAX, corresponding to the syscall number and store it in an array we call dwSyscallArray. 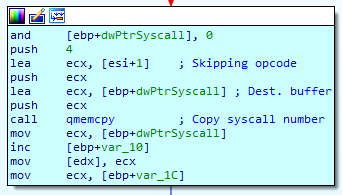 Whenever FlokiBot needs to call one of these native functions, it will call its own functions that directly retrieve the syscall number from the dwSyscallArray, pass arguments and trigger the interrupt 0x2E the same way it is implemented in ntdll. This is why you won't see any call traces of these API and monitoring tools that hook them will be unable to monitor the calls. Since the same functions and structures are used in the FlokiBot payload, you can refer to the "Full static deobfuscation with IDAPython" part below and easily adapt the provided IDAPython script to deobfuscate API calls in the dropper. An interesting feature of FlokiBot is that both the dropper and the payloads have an unhooking routine. The idea is to uninstall hooks written by monitoring tools, sandboxes and AV. Even though this is not the first time a malware uses such a feature, Carberp had one to hide from Trusteer Rapport and Carbanak more recently for example, it is pretty rare and worth noticing. In this part I will describe how FlokiBot performs unhooking. 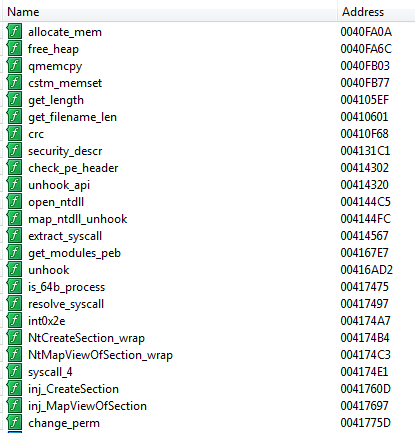 First, FlokiBot gets a handle to the ntdll.dll file on disk by listing dlls in System32 folder and using the hashing process we explained above, and maps it in memory by calling MapViewOfFile. As a result, FlokiBot has two versions of the lib mapped in its memory : the one it imported during the importing phase and that monitoring tools may have altered with hooks, and the one it just mapped directly from disk which is clean. Now that the correct permissions are set, FlokiBot pushes the address of the code section of the mapped clean DLL and the imported one and calls its unhooking routine. As a consequence, most monitoring tools, AV and sandboxes will fail to keep track of the malware calls. This is particularly useful if you want to avoid automated analysis from online sandboxes like malwr.com. You can find a Python script to dump the payloads and their config on the Talos Group Github here : https://github.com/vrtadmin/flokibot. Note that they don't execute properly on their own since they are supposed to be injected in a process and need some data written in memory by the dropper. We will describe this injection in the next part. The first shellcode written in explorer.exe (called trampoline) will sleep for 100 ms. and then call a function that the dropper mapped in the process memory at 0x80000000, called sub_405E18 by default in the dropper. This second stage is the one responsible of extracting the bot payloads, decrypting and uncompressing them. All this happens in explorer.exe / svchost.exe memory. sub_405E18 will resolve its imports by the same process as the dropper and the payload, using a slightly different crc32 and a new XOR key. With these functions, the code inside the process is able to read the resources (bots & RC4 key) of the dropper and map the payload in memory. Finally, the context of the suspended remote thread is modified so that its EIP points on the first shellcode, and the thread is resumed. The payload is based on the well-known and already analyzed ZeuS trojan so I won't detail everything. As for the dropper, I will focus on the deobfuscating parts and the improvements implemented in FlokiBot. First, we notice some important functions of the payload being reused from the dropper. Producing a Rizzo signature of the dropper and loading it in the payload allow IDA to identify and rename quite a few functions. The idea is to reimplement the hashing process in Python, hash all API exported by the DLL FlokiBot loads, and then compare them with the hashes we collected in the code. If there is a match, we use IDAPython to rename the function, making the disassembly more and more readable. 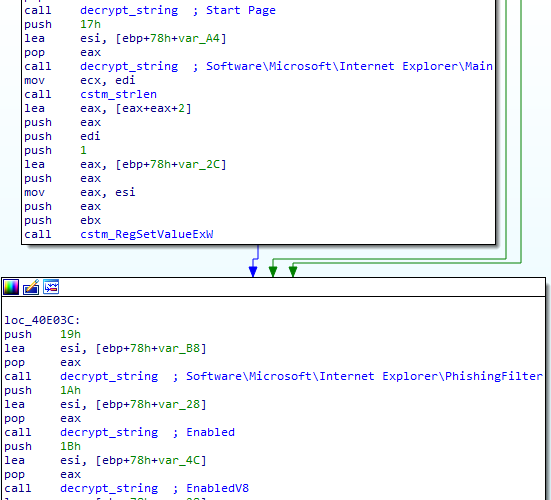 The payload uses the same CRC function and the same XOR key, so the script will work for both of them. First, I ran a short script to list how parameters of decrypt_string were pushed on the stack to figure out how to retrieve them without errors. Here is the full Python script I wrote to deobfuscate the payload : https://gist.github.com/adelmas/8c864315648a21ddabbd6bc7e0b64119. The bot copies itself to C:\Documents and Settings\[username]\Application Data under a pseudo-random name and achieves Persistence by creating a .lnk in the Windows startup folder. Most of them are standard hooks installed by ZeuS and most banking malwares. 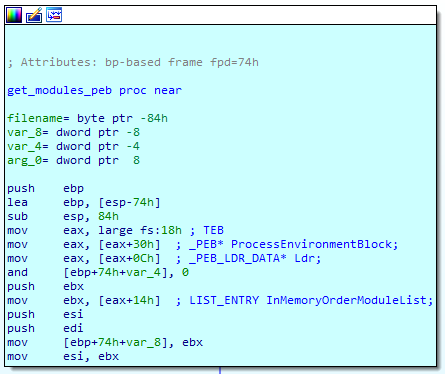 Though, we can notice some interesting new hooks on NtFreeVirtualMemory and NtProtectVirtualMemory. We will see their uses in the next parts. Floki implements Man-in-the-Browser attacks by injecting itself into Firefox and Chrome process and intercepting LdrLoadDll. If the hash of the DLL that is being loaded by the browser matches with either hash of nss3.dll, nspr4.dll or chrome.dll, API hooks are installed accordingly allowing the malware to perform Form grabbing and Webinjects. Man-in-the-Browser in Internet Explorer is trivially done by Wininet API Hooking (see functions above). Chrome Webinjects are not implemented yet. 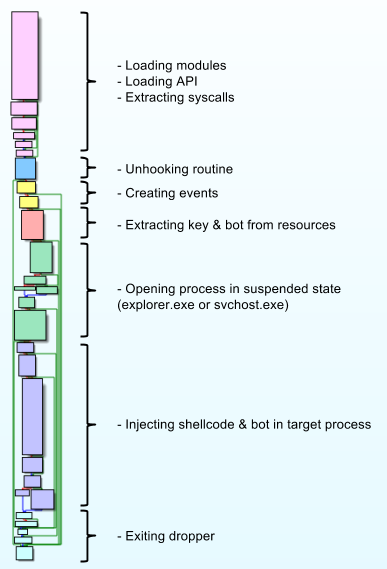 The malware hooks NtResumeThread API to inject its shellcode and its payload in other child process. FlokiBot is able to steal digital certificates by hooking PFXImportCertStore, using the same code as ZeuS and Carberp. Floki protects its hooks by putting a hook and filtering calls on NtProtectVirtualMemory to prevent tools like AV from restoring the original functions. Whenever a program tries to change memory protections of a process Floki is injected into, the malware will block the call and returns a STATUS_ACCESS_DENIED. In my previous article, I reversed a very basic PoS malware called TreasureHunter that uses RAM scraping as its main way to steal PAN. 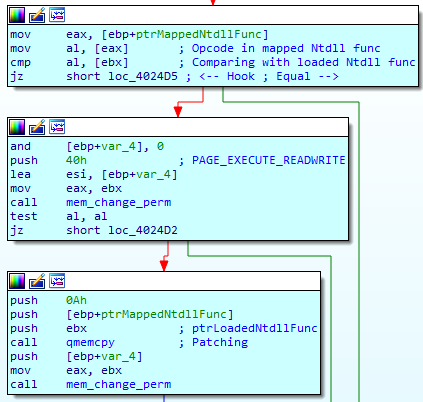 Like most PoS malwares, FlokiBot searches for track2 PAN by reading process memory regularly. Obviously, this isn't very efficient since you can't constantly monitor the memory, you will miss on a lot of potential PAN in between scans. To overcome this issue, after Floki injected itself into a process, it will also puts a hook on NtFreeVirtualMemory so that it looks for track2 PAN whenever the process wants to free a chunk of memory and before it is actually freed. This way, it is far likely to miss PAN. FlokiBot doesn't support TOR yet, but you can find some traces of this feature in the code. 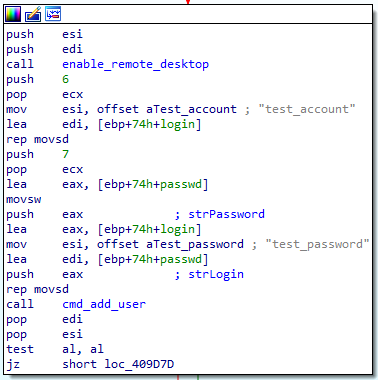 The payload tries to activate the remote desktop feature of Windows manually through the registry, and executes a console command to add a hidden administrator account test_account:test_password. Cybercriminals have been using remote desktops more and more since ATS became way too complex to code and too hard to deploy. This way, they get a full access to an infected computer to learn about the target and its habits and perform fraudulent tasks such as money transfer manually. FlokiBot is yet another malware kit based on ZeuS, with some pieces of code directly taken from the Carberp leak. 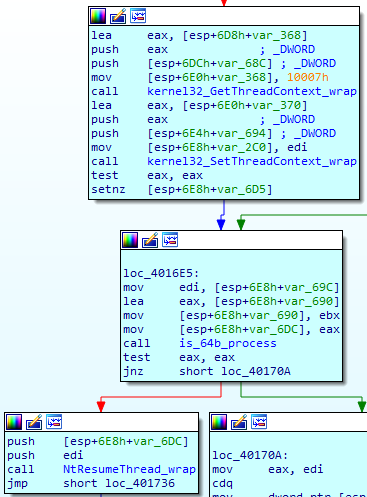 Nevertheless, its dropper, its unhooking routine and its PoS malware feature make it an interesting malware to analyse. 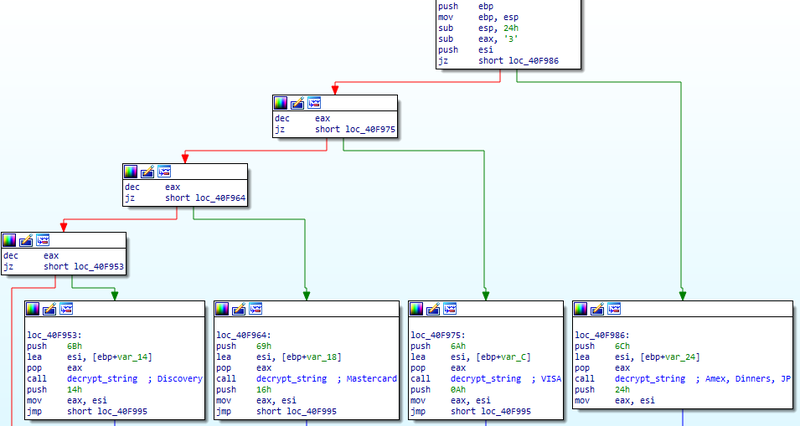 Also, its obfuscation techniques are simple enough to be reversed statically with some IDA scripts without making use of AppCall.